This large, exquisite and exceedingly collectible Red Zebra Marble Gemstone Egg was mined, sculpted and richly polished by hand to a high gloss finish in Pakistan � the only place on earth where Red Zebra Marble is found. Highly sought after by both beginning and serious gemstone egg collectors and home decorators alike, it is an excellent example of this how this lovely, semi-precious gemstone grows deep within Mother Earth. 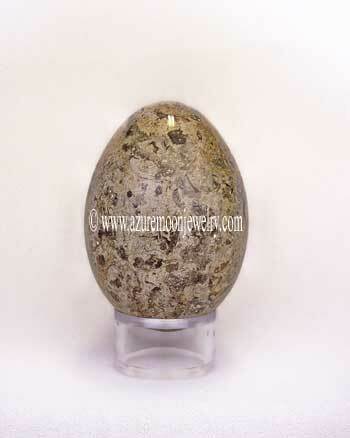 The beautiful crystalline structure of this egg is comprised of brecciated (fragmented) patterns of reddish brown and dark maroon with grey, rust and white veining on one side (pictured) and more brecciated reddish brown and maroon patterning with abstract white speckles and veins on the reverse and bottom. 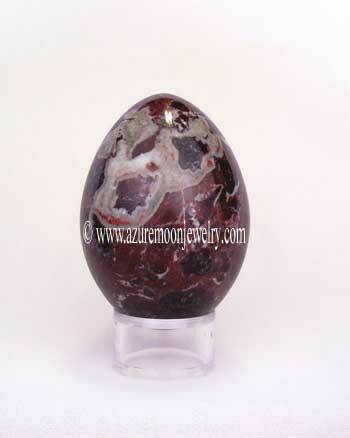 This Red Zebra Marble Gemstone Egg is the size of a duck's egg and measures approximately 2 15/16 - 2 1/16� W and weighs 278 grams or 1390 carats. The crystal clear acrylic display stand is included.